I am participating in Wyrd Game's Iron Painter competition, where you need to assemble and paint a miniature from any manufactor in 2 weeks with a theme. It is a one-on-one painting competition that works out off of a single elimination bracket. This round's theme was "Fool's Gold." I did not like Cojo's open hand. Originally, I was going to put bananas in his hand, but then I remember my love of Donkey Kong the arcade game, and the movie "King of Kong" (check it out). Thus, it was time to 3d print up some barrels for Cojo to toss at Italian plumbers. I simple sliced off his thumb, rotated it, and greenstuffed over the cut marks. 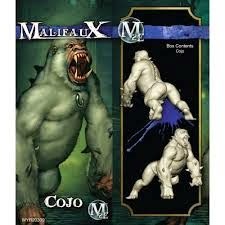 Cojo, much like all Malifaux models so far, was very enjoyable to paint. I challenged myself this time to have more detailed eyes, instead of simple 2 color ones. I met my deadline, and let's see if I get to push on to Round 2. 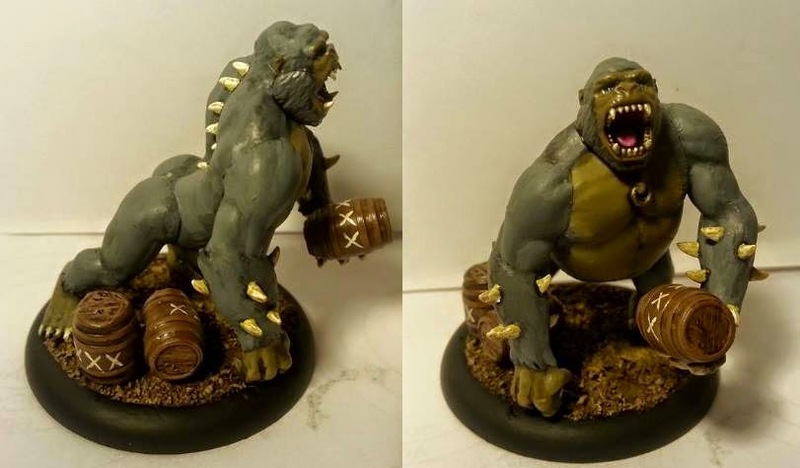 Win or Lose: I am going to keep going in the challenge unofficially, in order to get my Malifaux Crews painted.